Get ready for a party all thanks to the Minion Birthday Invitation. Despicable Me fans young and old can now send out their own personalized invitations. These invitations look a lot like a blackboard with on it a row of balloons that spell “Hooray” and on one of the balloons, you can see a minion just hanging. 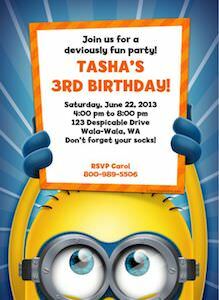 Just type all the personal info when you order and you will get these fun Minion invitations just the way you want. You can select different styles of paper and in different sizes too and all come with an envelope. And as you can get can get just one invitation or 1 billion you can get the right amount without having to worry about wasting a bunch. 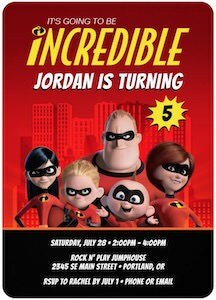 If you are going to have an Incredibles birthday party then you want to check out these The Incredibles birthday invitations. These party invitations are personalized with all your information filled out on the card so that you don’t have to write them and they look really amazing. The red and black background look great especially as the whole Incredibles family is on it and they seem to be really happy for your party. You can use these fun invitations for any party like a Incredibles viewing party or a birthday party. Each invitation comes with a white envelop and you can get as many as you need so no left overs as they are made specially for you. If you are planning a birthday party then of course you want some nice invitations. And if you are planning a Big Hero 6 party then you have to look at these amazing invitation cards. These Big Hero 6 invitations show Baymax and Hiro in their amazing costumes and besides that it will have your party information printed so no writing numerous cards as it will be on their the way you want it. And these birthday invitations come in different styles of cards and all come with envelops and you can buy as little as one or as many as a million. Get ready to plan that party and let Baymax and Hiro be there to. 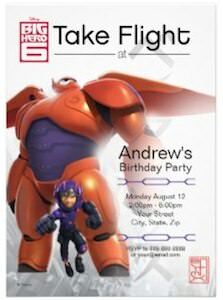 Come check out all your options of Big Hero 6 Birthday Invitations. Are you planning a Guardians of the Galaxy birthday party? If you are then you have to invite all those kids for the party. But luckily for you there are these cool Guardians of the Galaxy invitations. These Guardians of the Galaxy party invites comes in a pack so that you are set to get all your friends to be there. 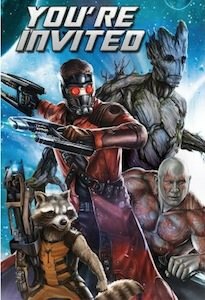 On the front of these invitations you can see in big letters “You’re Invited” and below that you can see Groot, Drax, Star-Lord and Rocket Raccoon all ready to protect you guests. Have fun planning the party but lets starts sending out those Guardians of the Galaxy Party Invitations. Any party start with an invitation. 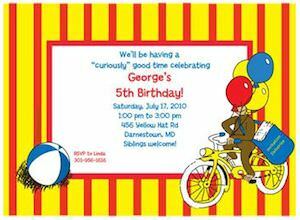 So if you are having a Curious George party then you need fun invitations that match that theme. And we might have found the perfect birthday invitations for you party and you don’t even need to write the cards as they are printed with all your information on it. These cards show a yellow border with red lines and a beach ball in one corner and then there is a monkey on a bike with balloons in front of his face. And besides all that the middle of the card is white and that is where your information will show up. Start planning your Curious George party and start with these Curious George Party Invitations. If you are planning a train birthday party then of course it should be all about Thomas the Train. And a party starts with amazing invitations and we found the perfect once for this party. 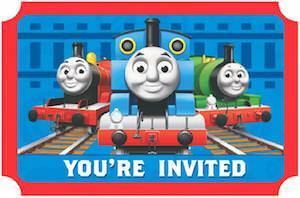 These invitations show Thomas the Train and two of his train friends and in big letters the words “You’re Invited”. And this Thomas the Tank engine invitation comes in a pack of 8 and yes it includes envelopes to so that you are set to invite all your friends to your party. A fun party all starts with finding the perfect theme and with Thomas and trains you may have hit the jackpot. Are you planning a My Little Pony Birthday Party? Every Party begins with the invitations. 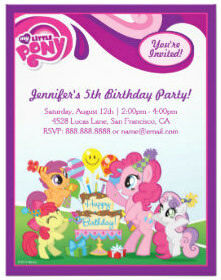 Start by sending out these special looking My Little Pony invitations for your party. Featuring Pinkie Pie with her friends around a birthday cake, balloons and presents. You can personalize with all your information right above the picture. The invitation is 4.25″ x 5.5″ in size and includes standard white envelopes for mailing. Its high quality paper with full color on both sides. They also come in 20 different styles of paper and colors. Make your party a fun My Little Pony theme today. Friendship is magic so invite your friends to the party with these special My Little Pony Party Invitations. Are you gone have a Minion or Despicable Me birthday party? If you are planning that then it will all start with invitations. 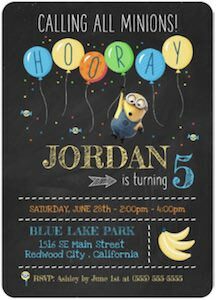 Luckily we found these fun Minion invitations that have all you parties info on it so no more writing they just come with everything on it. And these Despicable Me party invitations come a piece so if you need 5 you get 5 or if you want 3 you get 3 no more left overs with these invitations. And besides the invite the also include an envelope to make it all ready to go. Start planning you party with these fun Despicable Me Minion Birthday Invitations. If you are gone have a Doc McStuffins birthday party then of course you need special birthday invitations to. 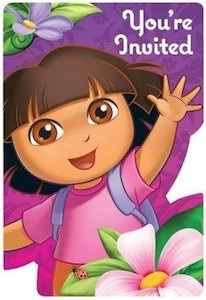 These Doc McStuffins invitations have all the information about your party printed on it so no writing or messing up. And these birthday invitations comes in the pieces you need so if you invite only one friend they you order one card if you invite 100 then you get 100 invitations. And this Doc McStuffins birthday invitation of course shows the doctor and also Lambie standing next to all the info about your party. Each invitation card comes with it own envelope to make it easy to send or hand out. 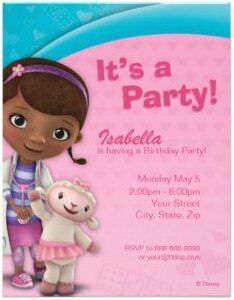 Get ready to party and the party start with inviting your friends with these Doc McStuffins Birthday invitations.